There is a huge variation in cancer survival rates across the world, a global study shows. The US, Australia, Canada, France and Japan had the highest five-year survival rates, while Algeria had the worst, Lancet Oncology reported. The UK fared pretty poorly, trailing most of its western European neighbours - although the data is from the 1990s since when survival rates have risen. Spending on health care was a major factor, the study of 31 countries said. 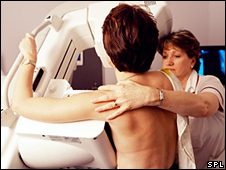 Researchers said higher spending often meant quicker access to tests and treatment. The research was carried out by more than 100 scientists across the world led by Professor Michel Coleman, of the London School of Hygiene and Tropical Medicine. It involved analysing data on more than two million cancer patients who were diagnosed and treated during the 1990s. The study showed the US had the highest five-year survival rates for breast cancer at 83.9% and prostate cancer at 91.9%. Japan came out best for male colon and rectal cancers, at 63% and 58.2% respectively, while France fared best for women with those cancers at 60.1% and 63.9%. The UK had 69.7% survival for breast cancer, just above 40% for colon and rectal cancer for both men and women and 51.1% for prostate cancer. There were also large regional variations within the UK, which were linked to differences in access to care and ability of patients to navigate the local health services. Both are directly linked to deprivation. A Department of Health spokesman said the report covered patients diagnosed between 1990 and 1994. "Since that time, cancer survival rates in England have been steadily improving for but we accept that there is further work to do to reduce the gap between us and the rest of northern and western Europe and America." Algeria, the only African country involved, came bottom in all types of cancer. It meant an American man was four times more likely to survive prostate cancer than an Algerian, while a Japanese man was six times more likely to survive colon cancer. Poland, Slovenia, Brazil and Estonia had survival rates half as good as the best performers. The results closely mirrored the amount each country was spending on health during the period. While the US led the way with more than 13% of gross domestic product spent on health, Canada, Australia and the best-performing European nations were all spending about 9% to 10%. The UK was spending just over 7% but that figure has now been increased following record rises in the NHS budget to bring it much closer to the likes of France and Germany. Algeria was spending around 4%. The importance of money was further illustrated by an ethnic breakdown of outcomes in the US. White Americans, who are on the whole wealthier and therefore more able to afford the insurance which underpins the US system, were up to 14% more likely than others to survive cancer. Professor Coleman said some of the differences could be attributed to variations in "access to diagnostic and treatment services". "This, of course, is associated with the amount of investment in technology such as CT scanners." Dr Lesley Walker, Cancer Research UK's director of cancer information, added: "The report is the first major study to compare cancer survival across five continents and has highlighted the stark differences in survival between poor and wealthy countries."